"The Southern Baptist chain stated Thursday that the author’s statements 'contradict LifeWay’s doctrinal guidelines,' and it has discontinued selling her books in its 185 stores or online." Reprinted with permission from As I See It, which is available free by writing to the editor at dkutilek@juno.com. That quote is universally associated today with the name Jim Elliot, one of five American missionaries who were martyred in South America in the 1950s. He had indeed written them in his journal, and they convey a profound truth. But they did not originate with Elliot. Almost those precise words were spoken and written centuries earlier. 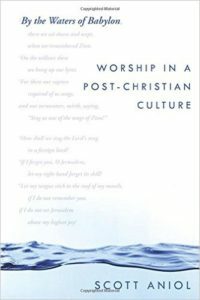 Scott Aniol’s new book, By the Waters of Babylon: Worship in a Post-Christian Culture, argues at length against the architects of missional evangelism—not because Aniol thinks the attractional model (of Hybels, Warren, et al.) is better, but because he doesn’t see cultural forms as neutral, suitable for any message including the gospel. Although the missional church seems to correctly recognize the nature of the Christendom paradigm in western civilization and in many cases rightly discerns the integral relationship between Christianity and culture during that period, it appears to view this development in the history of the church as entirely negative, with very few positive fruits. At the very least, most missional advocates see what happened as merely neutral contextualization of the church’s worship to culture, yet their very quick dismissal of worship forms coming out of that period as simply antiquated “relics” reveals what may be a simplistic understanding of the impact of the church upon culture during that period. This perspective limits their ability to recognize the strengths of the cultural forms from that period in expressing Christian values and the vast differences that exist today with regard to culture and contextualization in worship. This definition is excellent, as is the remaining discussion, which is based on it. They go on to describe weakness and strength as a spectrum2 extending from permissive (strong) to strict (weak). This is the pattern for the rest of the book, where “weakness” is treated as strictness, not theological immaturity. As their titles suggest, the first two chapters deal with defining the conscience. Chapter 1 defines the conscience as “your consciousness of what you believe is right and wrong.” Chapter 2 examines how the New Testament writers taught about conscience and develops a biblical understanding of the conscience from these data. Included in this is a definition of the “weak conscience”: an “uninformed moral consciousness.”2 As we’ll see later, this is the first of two definitions given in this book, and this presents a dilemma. Chapter 3 answers, “What Should You Do When Your Conscience Condemns You?” The answer is the gospel, for nothing but the grace of God in the atoning work of Jesus can free us from guilt. This applies to the lost man approaching the cross with his guilt and the long-time believer who must again and again return to God in confession and seek forgiveness. We must never allow our guilt to become a tool for the accuser to bring us to despair. Romanticism vs. church membership in "Is Church Membership Biblical?" "Do formal commitments enhance or stifle the heart’s longings? Romanticism, as the 19th-century literary and philosophical movement was called, insists that formality represses truth and that the only honest lifestyle is to follow one’s heart." Read more about Romanticism vs. church membership in "Is Church Membership Biblical?" Many of us recognize Robert Cornuke as the man whom many believe discovered the real Mt. Sinai. He is also president of the Bible Archaeology Search and Exploration Institute, and has been featured on major television networks including ABC, FOX, CNN, National Geographic, and the History Channel; he received his PhD from Louisiana Baptist University. What I especially appreciate about the author is that he begins with complete confidence in the Scripture. If accepted tradition contradicts Scripture, Cornuke’s game is afoot. Cornuke quotes a number of passages that equate Zion with both the Temple and the City of David. Since the “Temple Mount” sits outside the old City of David, Zion and the Temple Mount cannot be one and the same.